Guaranteed to keep you laughing is the original and funny, “Bernie and Red”. The popular husband and wife music and comedy team is bringing their talents to Rio Bend. You do not want to miss this, so mark your calendar for March 4th at 7 p.m. in the portico. Event tickets are $10 per person and are on sale in the Activity Center. Activity Office is open 9 a.m. – 4 p.m., Monday through Friday. Tickets are available at the door. Remember that we have free entertainment every week! If you enjoy dancing join Dennis and his group for Saturday Pub Night 7 – 9 p.m. On Thursdays we have a fun evening of Karaoke, in addition to Taco Tuesdays and our Friday Night Fish Fry.. The poolside bar is open from 4 – 8 p.m. Monday through Friday. What is all the excitement at Rio Bend in February 2016? February 3, Right Path Health Screening is offering a complete Cardiovascular Ultrasound evaluation for only $200. Included in the package for is a check of your blood pressure, pulse and blood oxygen saturation. Schedule an appointment by calling 800-770-0240. Testing will be performed in the Activity Center. Join your friends at the portico to watch the NFL’s top teams face off on the gridiron. Bring your favorite Super Bowl Party food to share with friends and meet at 3:00 p.m. on Sunday, February 7th at the big screen T.V.’s under the portico to cheer for your favorite team. Bar will be open. Mardi Gras (French for Fat Tuesday) is celebrated on February 9th. Break out the masks and beads, let loose, dance and enjoy the celebration! The fun begins with the annual “Rio Bend Mardi Gras Parade”, so decorate those golf carts, bicycles, don your favorite costume, and share in the celebration. A potluck will follow at 4:30 and Street Dance at 6 p.m. This year we have an awesome live band. 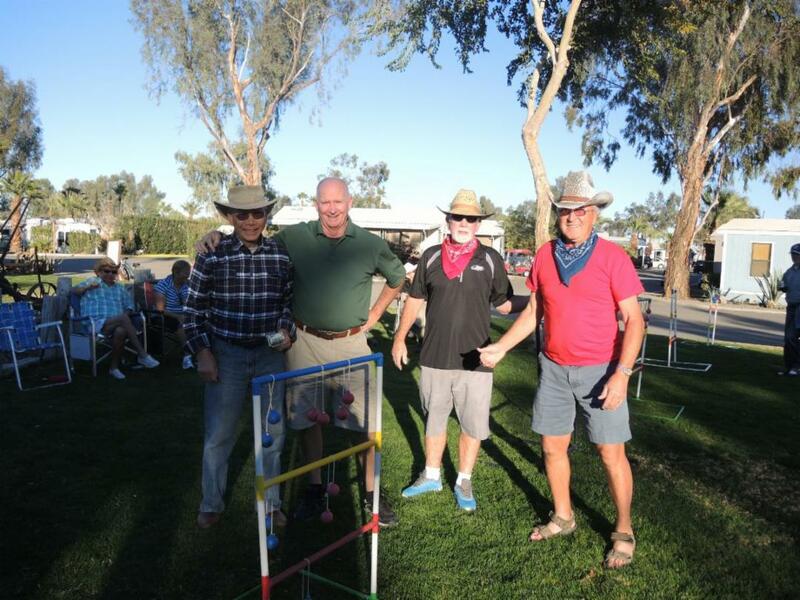 “Big Bad Wolf” is a local Imperial Valley five-piece band that plays rock and roll and country music. Join your friends for the fun festivities. Sunday, February 14 is a day of romance. 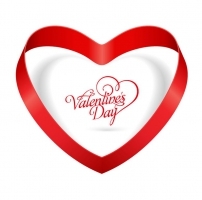 Celebrate with your special someone at the Rio Bend St. Valentine Dinner/Dance. Julia has planned a delicious dinner of Cornish Game Hen, rice, vegetables, and dessert for $15.00 per person. Dinner will be served at 5:30 p.m. Romantic dancing music will follow the delightful dinner. Purchase tickets in Activity Center. You Are In Luck ! 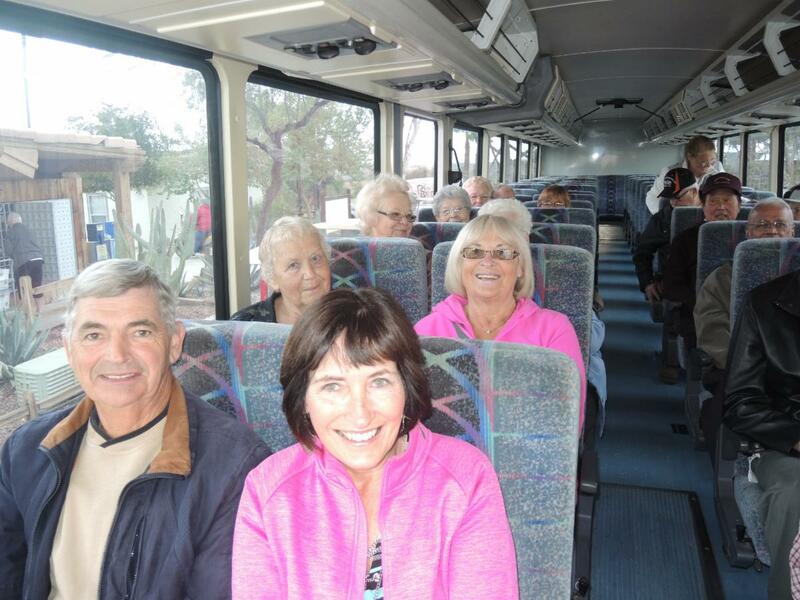 The Golden Acorn Bus will be here on February 15 to take you and your friends on a free, comfortable ride through the mountains to a fun day at the slot machines and table games. Plus, you will be given freeplay money. Seats on the bus are limited. Sign up in the Activity Center. Our annual Poolside Luncheon and Fashion Show is one of the highlights of this month. Sandi Paynter is working with Dillards Department Store to showcase some fabulous evening wear, sports outfits, and casual clothing. Once again, Rigo will be escorting our lovely models. This affair is always a sell-out, so pick up your tickets in the Activity Center. Walk, Talk and Shop is Rio Bends version of your local flea market. Take your time and stroll around the resort, visit with your friends and you may find something you may like or need. One man’s trash is another man’s treasure You never know what you will find. It is also a way to clean out the house and make a little extra cash. Set up on Saturday, February 20 at 9 a.m. until noon. More than one million people in the United States are stricken with cancer every year. Pub Night is Saturday, February 27 and we support the American Cancer Society and their quest to eliminate cancer. The Activity Department will sell lighted luminaries to be decorated and dedicated to loved ones that have been lost to cancer and for “Cancer Survivors”. The luminaries will be displayed along the sidewalk. Donations will be accepted, so please join us to support cancer research, education and patient assistance. Check the Rio Bend Calendar for regularly scheduled activities to relax and enjoy! There was a great turnout for Western Week. 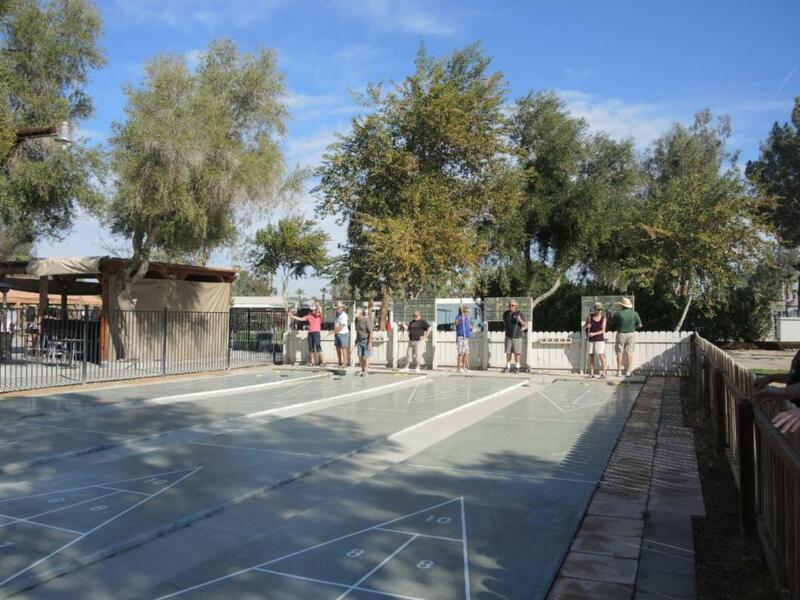 Residents teamed up and competed against each other in pickle ball, shuffleboard, bocce, ladder ball and putters challenge. Game winners received prizes for free Fish Dinners, Taco Plates, coupons for the Ice Cream Social and tickets to our big entertainments. A special thank you to our volunteers for their help in organizing the games. Julia and her cheerful staff are cooking up specials at the Pro Shop Snack Bar daily 9:30 a.m. to 3:00 p.m. Menu includes hamburgers, hotdogs, turkey burgers, taco salad, grilled chicken salad and more. 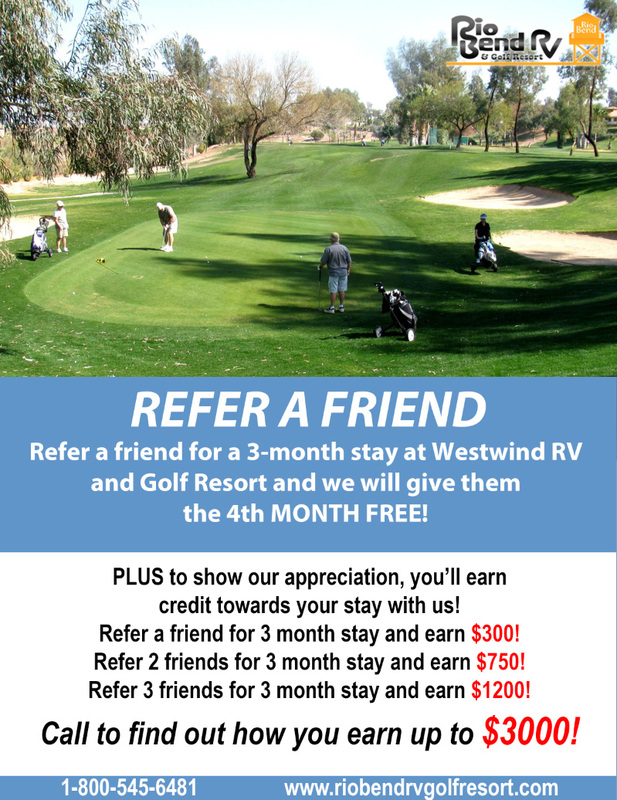 There is a gorgeous view of the golf course and mountains from the patio to enjoy while you visit with friends. Sodas, beer and wine are available in café. Let’s Get Active! Start the New Year with a resolution to be healthy. Check out the new treadmills, stationery bicycles and elipticals and in the Fitness Center. Stop by the office for the door code for your 24 hour access to workout. Gold Zumba Class led by Irene Ortiz is every Monday, Wednesday and Friday at the Fitness Center. Or join everyone in the pool on Tuesday and Thursday for water Zumba. 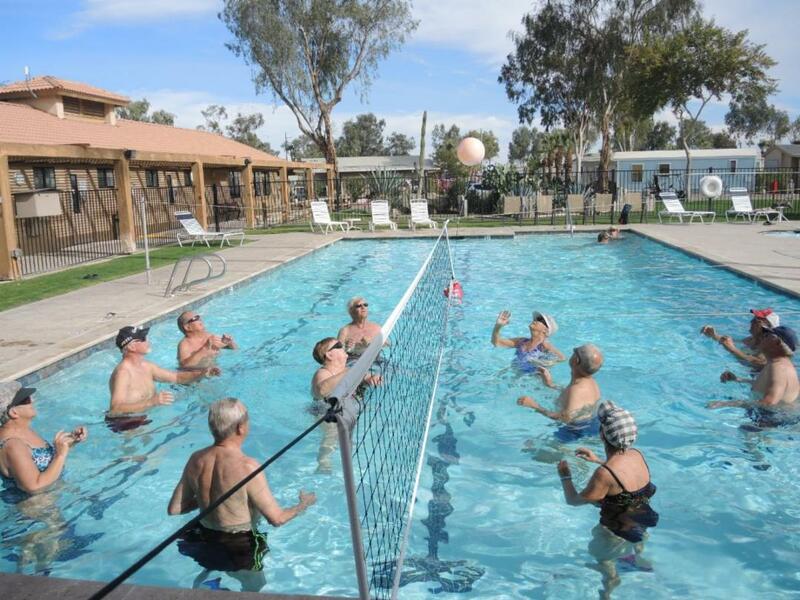 Water aerobics is every morning Monday through Friday and the water volley ball group plays on Monday, Thursday and Saturday. 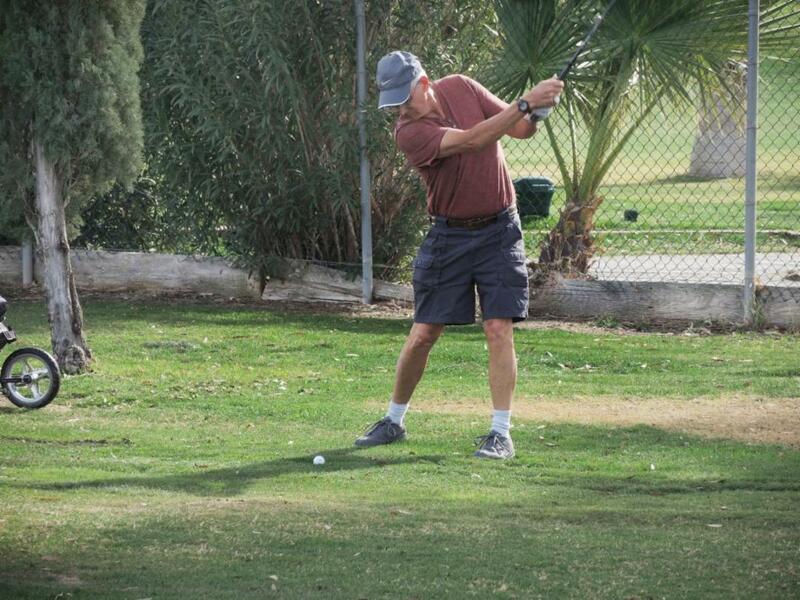 CONGRATULATIONS to Rio Bend Golfers for winning the Annual Rio Bend vs. Sunbeam Tournament. We had a terrific turnout of 42 players from Rio Bend and 36 players from Sunbeam. 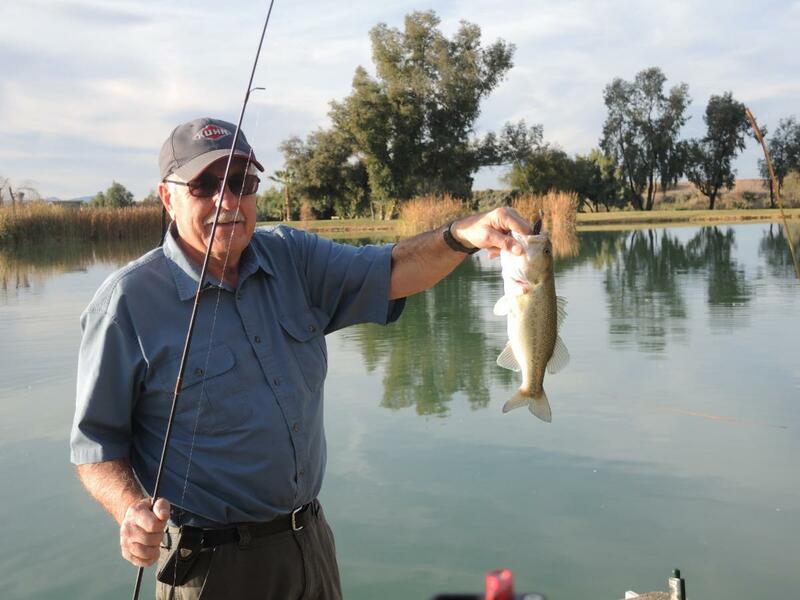 Tom Wipfli from Wellington, Nevada, an avid fisherman and RVer, caught a two pound bass. Rio Bend Lake is stocked with largemouth bass, bluegill and catfish that are always biting. Please use artificial bait and remember “Catch and Release”.